Area law enforcement experience tactical training at the University of Rio Grande and Rio Grande Community College. Lt. Seth Dourthett speaks before area law enforcement about the importance of timeliness and safety. 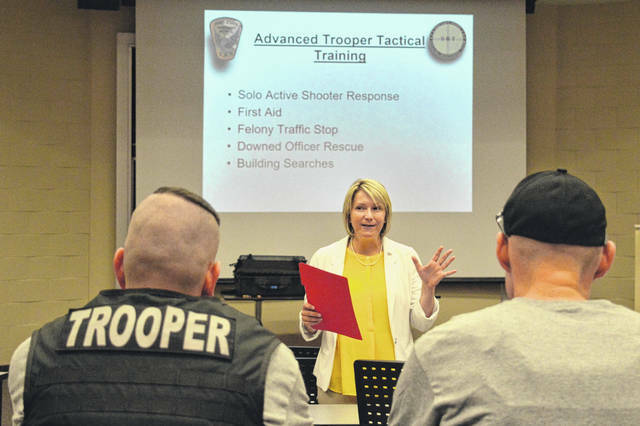 University of Rio Grande and Rio Grande Community College President Dr. Michelle Johnston addresses area law enforcement before lessons on tactical police and active shooter maneuvers are given. 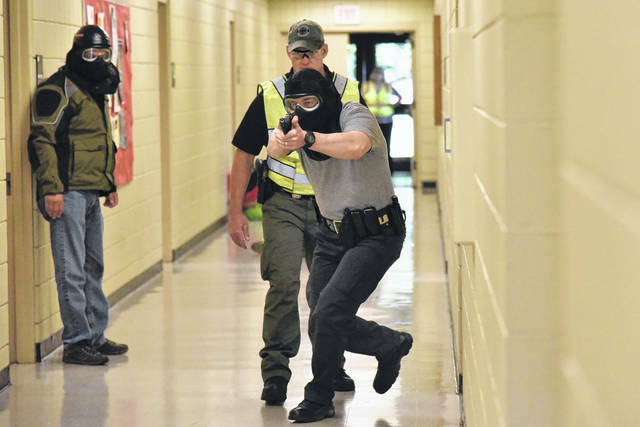 RIO GRANDE — Area law enforcement gathered in Wood Hall at Rio Grande Community College and the University of Rio Grande Tuesday afternoon for SWAT training. Rio Campus Police Chief Scott Borden welcomed visitors and stressed the importance of such training efforts. He identified with the Ohio State Highway Patrol as he spent over 30 years with it and thanked the Ohio State Highway Patrol Special Response Team for sharing its knowledge. OSHP troopers were present for the training as well as Rio Campus Police, Rio Grande Police Department and Meigs Sheriff’s Office deputies. An estimated 40 officers were expected to go through the training. OSHP’s Lt. Scott Dourthett served as the day’s lecturer. 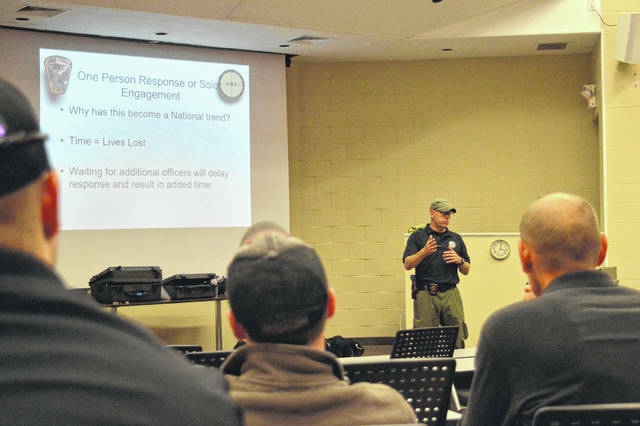 He said a current trend among law enforcement training methods was focused in one person response or solo engagement regarding an active shooter or aggressor. When law enforcement arrives on scene to a dangerous situation, unless a team member is a short distance away, they are expected to enter a facility to address a threat. Along with that threat comes all the training in how to enter a building that may have been locked or chained. “Whatever it’s called, it’s all the same thing. You’re going in to stop the threat,” said Dourthett. The lieutenant said different law enforcement agencies had different techniques and no one method was better than others. He encouraged officers to utilize a variety of training methods for different scenarios as no one call an officer was to respond to may be the same. Dourthett stressed that time lost equaled lives lost. Officers should expect to rank life priorities in a call as victims or the threatened first, bystanders and citizens next, the officers themselves and lastly the suspects. Decisions made should never benefit a suspect and should always be made in the interest of safety for the public. Dourthett said that even as a SWAT member, local law enforcement was considered as ranking higher in terms of life concern than a SWAT responder. Dourthett said that an active attack situation where real physical harm is being done to victims with multiple lives lost can easily be done within two to three minutes. Getting into a building was of the utmost importance. If an officer had to ram a cruiser into a building to gain entry to address a threat, he or she would need to do that. Cruisers can be replaced. Lives cannot. The last thing an officer should be worried about when addressing an active aggressor is jurisdictional concerns or backup, unless it’s an extremely short distance away. If an officer was not willing to enter a building alone to face a threat, he or she may need to consider another line of work. However, a loud and flashy entrance may not be the answer to addressing a scenario. The lieutenant said an officer may need to enter a window at times. Officers after the lecture would gather with practice weapons to run live scenarios in Rio’s campus buildings.